Based on the original formula, VBA and VB drumsets feature blended Birch Ply shells that deliver a dynamically balanced sound. The floor toms and bass drums gives the same amount of projection as the higher frequency rack toms, resulting in the best sounding kit in its price range. Vision Series offers a sonically advanced recipe of strategically arranged plies of premium wood to maximize frequency response of every component. 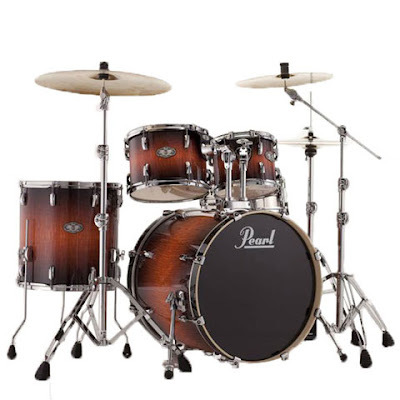 As with all Pearl drums, each shell is formed from our legendary SST construction process that uses extreme heat, Precision-cut scarf joints, our proprietary Acoustiglue and over 1000lbs of hydraulic pressure to create the ultimate acoustic air chamber. VBA drumsets come with a matching 6 ply, BirchPly snare drum. Pearl’s innovative SR-900 Duo-Motion strainer can be converted from a side lever action to a Gladstone-type throw-off. The precision contoured lever allows for fast and absolute on/off function. A large adjustment knob ensures fine tuning for superior snare sensitivity.